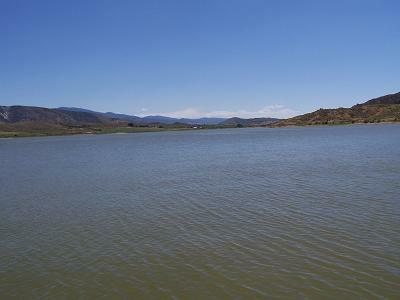 Gunnison Reservoir is located Northeast of Gunnison City, Utah. However, it is much easier getting there from Manti or Sterling. Take the road going from Palisades from Hwy. 89, go about 1/4 of a block past it heading South, turn right instead of left. It is a dirt road. It's about a mile to the dam from Hwy 89. Another way to get there is to turn right (West) at the first road in Manti heading South, at the fair grounds, past the school and the KMTI radio station. Keep going until it splits, and take the left road for about 3 miles. You can't miss it!